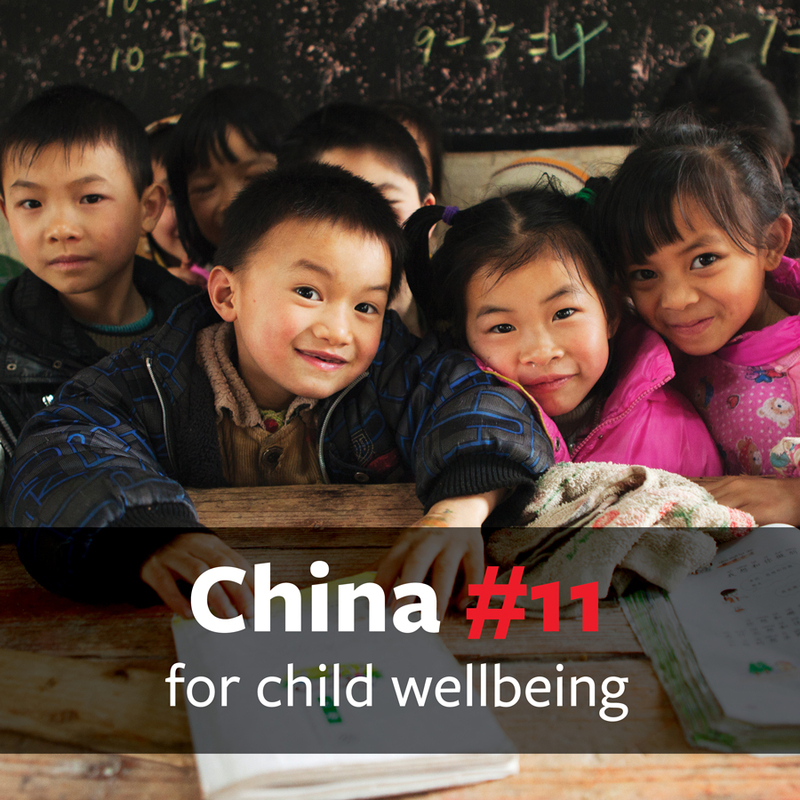 A new report ranks China eleventh out of the world’s 19 largest economies for child wellbeing, with strong outcomes in health, gender and employment dimensions relative to its peers. Germany ranked first for the second time running, while France was second and Japan third, according to the report of Save the Children’s Child Prosperity Index released on Friday. The index, designed by the leading international children’s organization, scores each of the G20 nations in eight areas: health, education, gender equality, safety, employment, environment, income and infrastructure. China ranked about the middle of all G20 countries for the first five out of eight areas and towards the bottom for environment, income (which includes inequality), and infrastructure. Compared to other middle-income countries, China recorded lower child mortality rates and high life expectancy at birth. These strong outcomes placed China above Turkey and the US in the health category. Improvements in China’s gender equality performance over the last couple of years have also contributed to a better quality of Chinese children’s life chances since the Index was last published in 2014. The environment is an area where China has a lot of room for improvement, with below average performance on CO2 emissions and air pollution, currently inhibiting children’s prosperity. The report highlights concerns also for universal education. Findings show that while almost all children complete primary school, there is a large gap in average years of schooling between children in urban and rural areas, as well challenges for those with disabilities. This year’s index has been launched to mark the meeting of G20 finance ministers in Beijing, which is a powerful opportunity for the world’s economic and political leaders to improve the lives of children in their own nations and across the planet. Save the Children is asking the G20 governments to take action for children in the following three areas: adopt progressive national tax systems to make finance fairer, remove social and economic discrimination and legal barriers for every last child, and properly track how their countries are progressing. “Few would argue that a child’s life chances should be determined before they are born,” said Wang Le, Interim Country Director of Save the Children in China. “Yet our analysis shows that even among the world’s most developed, powerful and rich economies, there can be vast disparity in how children are treated and how prosperous their futures appear to be. Growth does not necessarily deliver equality of life chances between children,” she stressed. “Countries like China need to think about measuring their progress by viewing economic growth as a means to an end – an end that delivers social, environmental and economic prosperity for all, especially children,” she added. This is the second Child Prosperity Index that has been published by Save the Children. It provides a snapshot and comparison of a child’s life chances across all G20 countries.